A visualization of a lean hydrogen flame simulation shows three computed fields simultaneously. A bowl-shaped turbulent flame floats over the exit flow from a pipe that is swirling as it moves upward. The gray filaments at the bottom depict regions of high turbulence, the transparent red surface highlights the mixing region between the fuel from the pipe and the air outside, and the purple-to-red zone shows the concentration of nitrogen-based emissions from the flame. With help from a Cray supercomputer, Lawrence Berkeley National Laboratory (LBNL) researchers John Bell and Marcus Day are studying the combustion properties of hydrogen – a potential fuel that science has been trying to tame for decades. To understand those effects normally requires experimentation. But experiments aren’t sufficient here because flames in those conditions are extremely hard to measure accurately – and the generated data defies easy interpretation. Although computer-simulated flames obviously don’t take place in a combustor and are not subject to Mother Nature’s unpredictability, they nevertheless are quite difficult to produce and study. 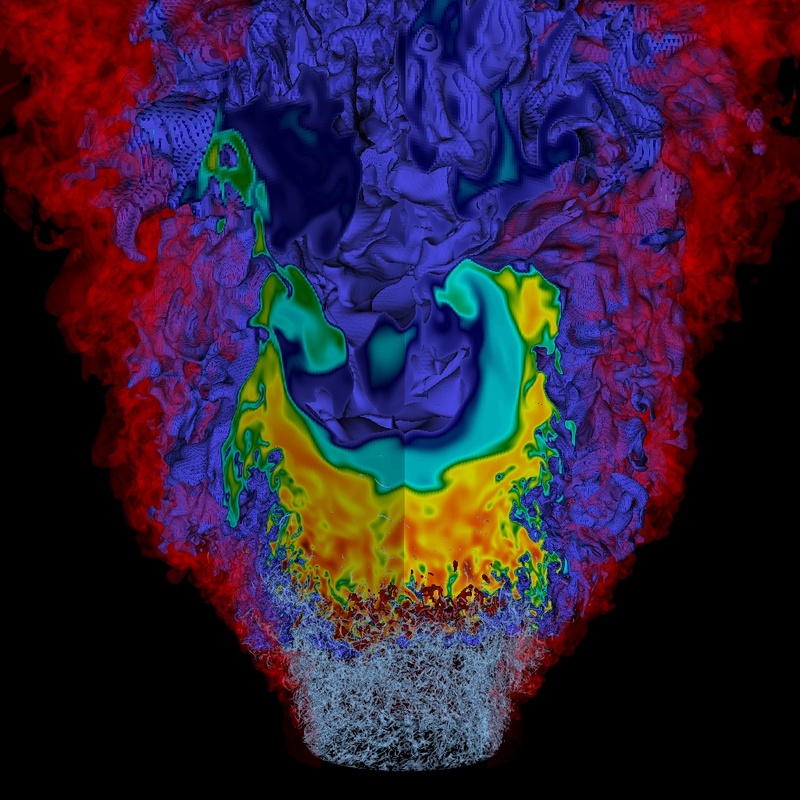 Experimental-quality combustion simulations are complex and require loads of computer time. Bell and Day have access to 40 million processor hours on Jaguar, based at Oak Ridge National Laboratory, through the Department of Energy’s Innovative and Novel Computational Impact on Theory and Experiment (INCITE) program. Running the simulations is only part of the challenge. The huge volumes of data that result must be compared to experimental data and further explored to understand the new information that the data contain. “Simulations don’t match experiments exactly,” Bell says, “but they do provide useful insights into how the flames are behaving.” The data help paint a more complete picture of the combustion system – a picture that is simply inaccessible by any other means. As Bell and Day figure out how to quantify uncertainties in the models they use to describe these systems, they can improve predictions and design more practical systems. Unlike fossil fuels that pump carbon dioxide and other pollutants into the air, hydrogen is virtually waste-free. It’s also a basic component of Earth’s atmosphere. Hydrogen is oxygen’s partner in forming water ­– and, it turns out, flames. In an idealized setting oxygen and hydrogen burn together with near-zero emissions but only if the mix is sufficiently lean, meaning a low fuel-to-oxygen ratio. However, at these leaner mixtures, the flame becomes highly unstable and difficult to use in practical scenarios. High-pressure conditions tend to exacerbate the difficulties. The same physics that makes hydrogen flames hard to study in the lab lead to difficulties on the computer. The flames blow off or flash back into the fuel supply. Strong turbulence can also have a huge impact – the flames will be twisted, violently shredded and possibly extinguished.